SteriPEN – UV Water Purifier | OhGizmo! UV light has long been used to rid drinking water of bacteria and other dangerous elements without the need for chemicals, boiling or other harsh treatments. You can now make sure the water you’re drinking is clean and sterile no matter where you are with the SteriPEN purifier. Just gently stir your glass of water with the handheld device for about a minute and your beverage will be disinfected and ready to drink. 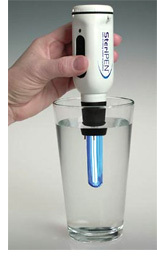 The SteriPEN is powered by 4 AA batteries and can purify about 16 oz of water at a time. I wonder if you can get a tan from it. This is a significant advancement in backcountry water treatment technology. I haven't had the opportunity to use it yet, but I hope that it lives up to the hype because this sounds much easier than filtration and/or chemical treatment.